Royale’s most popular Mayfair electric lift chair is now available in select studio high quality Vinyls to suit any setting and home décor. The Select Mayfair Chair features a very comfortable 3 Section Waterfall Backrest Design for Optimum Comfort and Upper, Middle and Lower back support. Featuring quality Actuators and American Branded Mechanisms means quiet motors for a Smooth & Discreet Operation. The Mayfair Select also comes with a FREE OF CHARGE set of locking castors for transportation. 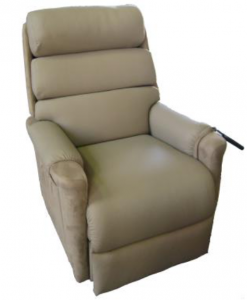 The Mayfair Select recliner lift chair features Backup Power Supply for user peace of mind. The Mayfair Select electric lift chair offers unbelievable value with its 2 Year Manufacturer’s warranty on the frame integrity, workmanship and electronics. The seat height of the Mayfair Recliner chair is 74cm and the Height from ground to the bottom of the seat at a lift position is 55cm approx.